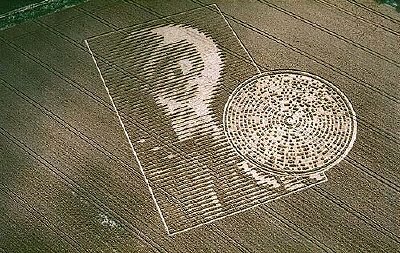 The “Scary Alien” Crop Circle. Browse: Home / The “Scary Alien” Crop Circle. M.J. Fussell, editor of the cropcircleconnector web site, seemed a little flustered on the phone as he tried to inform me of a new crop glyph that had appeared. From my end he sounded as if he was foaming at the mouth as he breathlessly tried to fill me in. All I got of any real value were the words ‘alien’ and ‘coded disc’. As the image of this most perplexing of crop formations appeared on the Silent Circle Café computer screen, faces filled with amazement, coupled with gasps of disbelief. What we were looking at was without doubt the most stunning, atmospheric and indeed the most sinister crop glyph that has appeared to date. An alien with a CD, that’s outrageous enough, but there it was, stretched across a field of ripe wheat in far out Hampshire. Our minds were made up there and then; we had to get on site ASAP. Something that subtle would no doubt take a severe battering from hoards of visitors. With this in mind the exact location of the new glyph was acquired and we were on our way. One and a half hours later and we were actually standing within the huge and, from zero elevation, almost totally incomprehensible alien body. Confusing would be an understatement here, even though we had seen the aerial image beforehand our ability to discern which part of the formation we were actually in was very difficult indeed. However once we had located the disc things began to get a little easier. That said, if one had not had the good fortune to see the overhead view before entering then the whole thing would have been near impossible to figure out. So how did it look and feel? Well, very much like the 2001 Chilbolton ‘Face’ and ‘Message’ formations. Subjectively there were very strange and oppressive feelings within the new arrival. One could almost say feelings of foreboding and awe were the overriding flavours of this event, as indeed was the impression we both felt almost exactly one year earlier over at Chilbolton, just nine miles away. It really did seem that the same agency had been at work, only this time the finished product is utterly staggering, above and below; indeed the 2001 events seem positively crude in comparison to this masterpiece, and that alone is quite a statement when one considers the reaction to those events at the time. Other interesting points of relationship include the fact that the new arrival is positioned on the highest point in the locality, as was the case at Chilbolton. Also there is the positioning of the formation in very close proximity to hi tech communications equipment, just like at Chilbolton. Coincidence? I doubt it. Maybe this positioning is a deliberate attempt by whatever agency that created this series of images to cultivate this bizarre, sinister kind of scary feel. If this was the intention it works very well, leaving one with very mixed feelings of excitement, anticipation, and confusion and for many observers, fear, again probably as intended. All laid crop areas were extremely neat when we arrived, with no evidence of prior incursion by more than a couple of people, at most. We had beaten the rush and were given the privileged opportunity to have one really good hands and knees look at the untrampled floor of this seemingly impossible design. And that we did! With the total absence of ‘stomper board’ markings throughout all areas of the formation examined, we had to conclude that it was that this was NOT a standard fake. The damage we caused to the laid crop was shocking. Everywhere we stepped we were smashing the plants under our feet, leaving very obvious signs of human body weight on the brittle, dry plants. How could a crew of fakers be in there and not leave the smashed up plants, stems broken and snapped. The crop was so dry and brittle that the very action of putting one’s foot down caused everything underfoot to literally crumble into a tangle of broken, shattered wheat. In short, what we experienced on the ground cannot be reconciled with any ground based hoaxing methodology that we are aware of. Could it be for real? After all an ET with a disc full of info for the people of the Earth to ponder is a very far out concept for most of the planets inhabitants. And really, if extraterrestrials wish to open communications why not just land saucers in Hyde Park? So could it be a ‘Big Brother’ scam job, employing sophisticated airborne / space borne technologies, intended to steer the real benevolent crop circle situation in a certain direction? Is there in fact a technology that could do such a thing? All we could say for sure is that somehow this amazing work is there and was almost certainly, we think, created from above. We then gave the formations exact location along with photos to a local dowser, endowed with remarkeble intuitive abilities, and asked her what she felt. Her response only deepened our suspicion. According to her: “I get that it was definitely man-made, as for the ‘how’ it I got a reaction to the use of microwaves coupled with computers. So what does this really mean? In answer we would suggest looking at the article ‘Counterfeit Foe: The Ultimate Hegelian Dialectic. Ed.